“Nothing free can be valuable” say some critics. That is, giving away things devalues them. This is obviously untrue in the digital realm, but what about physical things? The fear of the free was especially an issue in charity. If, with good intentions, you give medicines, or pumps, or solar panels, to the needed for free, won’t they neglect, or trade off, or ignore these gifts? 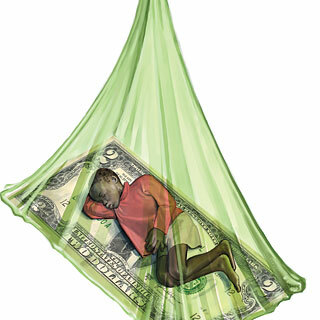 In particular, if you give long-lasting insecticide-impregnated mosquito nets to families in malaria territory, would they just use them for fishing, or sell them? Maybe you should sell them the nets originally for a small amount? Turns out after many years of testing, that the free nets are incredibly effective in reducing malaria. Free wins! The story by Jeffery Sachs is here in Scientific American. Or you can read the PDF for the academic paper on the experiment. Free or not, nets are a great idea and better than malarial drugs. If you want to fund a net ($10), there’s a number of places that help you do that, including Nothing But Nets. Better still might be the use of DDT and other chemicals that kill off the mosquitos that transmit the malaria in the first place. Might actually give those infected a chance to avoid being bitten during those moments in their lives when they are not under a net. But that would rob the humanitarians of the world of the chance to give away free netting. It’s heartening that this sort of intervention is working but it’s hardly a cure-all or an elimination of the problem… unless you have an inordinate fondness for malaria and mosquitoes. Well, fine, but limiting your methods to one vector alone such as this one only leave the poorest of the poor in perpetual dependency on the mosquito net supply chain; on the kindness of strangers. Unfortunately, some ofthe free given nets are abused to catch fish in the Lake Victoria region, with desastrous results because many too small fish are caught in the fine netting. Still, the free nets are a success! Definitely better than drugs. And definitely better than being taken advantage of drug companies that may misuse the situation. This is a great example of Free == Good. This could be because (to use a Classic Economy term) this good/product gives maximum utility (in this case, survival from disease) even though its free. This snapshot is regarding something that’s happening now. How about recent history? I would be interested to know if anyone had studied the effects one of our (mankind) largest effort at free-giveaways — basic education? Also, another possible scenario to study/analyse, post WWII Britain started the ball rolling to allow commonwealth countries to achieve independence. This intention was followed thru by many “free” giveaways from scholarships to technical trainings to vaccinations-plans to legal consultancy (that all included materials and tools). How did the effects of those free-things went? What worked? What didn’t? What are its effects/legacy today (i.e. forgotten or celebrated etc.)? Appreciate if anyone could dig into old reports and post some data. Or share on personal/family experiences.